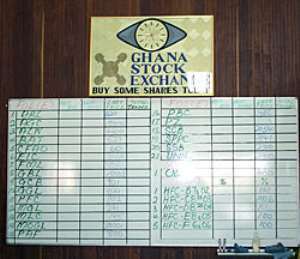 Accra, April 29, GNA - The listing of AngloGold Ashanti (AGA) shares on the Ghana Stock Exchange (GSE) on Wednesday moved the market capitalisation to 95,552.32 billion cedis from 3,293.08 million issued shares compared to the 20,009.01 billion cedis from 3,160.22 million shares recorded during Monday's trading. The market capitalisation of Ashanti Goldfields Company (AGC) that transformed into AngloGold Ashanti (AGA) moved up to 78,877.38 billion cedis from 262.92 million issued shares from 3,754.48 billion cedis from 131.05 million issued shares. The GSE All-Share Index went up by 49.5 points, more than double of what was registered at the previous trading. Traded volumes were; however, lower at 317,500 shares from Monday's 356,100 shares. Change for the year to date stands at 83.13 per cent. On the broader market, AGA closed trading at 300,000 cedis per share while 11 equities had positive price changes, with Mobil Oil Ghana Limited (MOGL) leading the pack with 2,449 cedis gain at 40,000 cedis. Standard Chartered Bank (SCB) gained 1,750 cedis at 88,850 cedis; Trust Bank Limited (TBL) was up by 500 cedis at 24,000 cedis; Guinness Ghana Limited appreciated by 300 cedis to 11,000 cedis while British America Tobacco (BAT) had 138 cedis at 7,600 cedis. Ghana Commercial Bank (GCB) made 99 cedis to move its share price 17,500 cedis; Unilever gained 50 cedis at 20,050 cedis; while the newly wedded Societe General-SSB Bank went up by 23 cedis at 29,600 cedis. Three equities made single digit gains with Home Finance Company (HFC) making eight cedis at 9,610 cedis while Cocoa Processing Company (CPC) and CFAO gained four cedis each at 1,481 cedis and 90 cedis, respectively. Market Capitalisation went up to 95,552.32 billion cedis from 3,293.08 issued shares 20,009.1 billion cedis from 3,160 issued shares during Monday trading as a result of the listing of the new AngloGold Ashanti (AGA) shares whose market capitalisation moved to 78,877.38 billion cedis from 3,754.48 billion cedis.